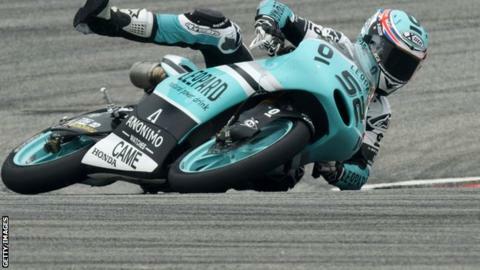 Danny Kent qualified ninth after a penalty for Sunday's Malaysian Moto3 GP as he bids to become Britain's first GP motorcycle world champion in 38 years. The Wiltshire racer needs to finish fifth or score 10 points more than rival Miguel Oliveira to claim the title in the season's penultimate race. The last British rider to win a world title in any grand prix class was Barry Sheene on his 500cc Suzuki in 1977. Italy's Valentino Rossi can win his eighth MotoGP world title in Sepang. Rossi, 36, will be the oldest world champion in the class since 1949 and will also set a record for the most starts with 329. He will claim the title if he wins the race and nearest challenger and Yamaha team-mate Jorge Lorenzo does not finish in the top five. Rossi will start from third on the grid with Lorenzo in fourth as Dani Pedrosa took pole. What does Kent need to do? Kent will feel confident he can wrap up the Moto3 title with the final race of the season in Valencia still to come. He has scored 10 top-five finishes in 16 races on his Leopard Racing Honda, with the British Grand Prix at Silverstone one of five wins. However, Kent has recently failed to live up to his early-season dominance and earned just one podium finish in his last seven outings. He initially qualified sixth for Sunday's race but suffered a three-place grid penalty for riding slowly as riders tried to get into his slipstream. Oliveira is third on the grid. Kent said: "It was a frustrating qualifying. A lot of riders tried to follow me even when I entered the pit lane to try to come away from them all, but my strategy didn't work out. "The most important thing is that we're ready for tomorrow's race thanks to a fast and consistent pace." The Moto3 Malaysian GP starts at 04:00 GMT and is followed by the MotoGP race at 07:00 GMT.